McGill’s Faculty of Law enjoys a rich tradition of human rights education and involvement. Since 1992, the Faculty has established a number of partnerships with non-governmental organizations (NGOs) in Canada and abroad. 2018 Internships: applications [.docx] due on Monday, October 22, 2018 at noon – Emailed to hrinternships.law [at] mcgill.ca. Meet all the interns (IHRIP blog). Administered by the Centre for Human Rights and Legal Pluralism (CHRLP), the International Human Rights Internships Program (IHRIP) is a fully credited course that allows students to earn six (6) credits toward the completion of the BCL/LLB degree. The Internship Program is managed by the Faculty’s Human Rights Committee under the direction of Professor Nandini Ramanujam. The Program interviews and selects law students for placements as interns with NGOS, courts, and public institutions for a period of 12 weeks over the summer. Partner organizations provide students with practical work experience in human rights investigation, monitoring, and reporting. The internships also provide exposure to the operation and implementation of human rights instruments and norms. 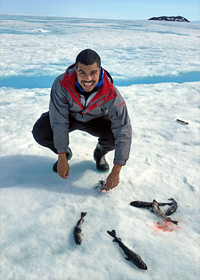 Dominic Bell (Maliiganik Tukisiiniakvik 2015), participated in local activities, such as line fishing. Students participate in the Program as volunteers, with partial funding from the Faculty of Law. Following their summer placements, interns return to the Faculty with practical training and personal experience that enrich the intellectual and social life of the law school community. The Program consists of (3) credits during the summer semester and three (3) credits in the fall semester. The three (3) summer credits go towards the 12-week field placement and a short Internship report. The remaining three (3) fall credits count for the seminar course leading to a research paper. Applications are normally due at the end of October for the following summer. N.B. The total number of non-course credits taken throughout the BCL/LLB program may not exceed 15. Human Rights Internships only counts for three non-course credits. Students participate in the Program as volunteers, and receive no salary for their work. Students should keep in mind that they will have to pay the registration fees for a 6-credit course. 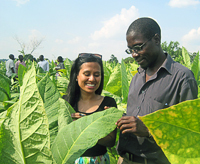 Intern Lipi Mishra (CEHURD 2013) learning from rural community leaders. The Faculty will cover the cost of a return flight between Montreal and the site of a student's internship. To minimize costs, all travel arrangements are made through a McGill-affiliated travel associate. Students will receive a stipend from the Faculty of Law. The stipend awards cover a significant portion of the costs of living in each of the destination locations. Students who undertake to raise additional funds for their internships may obtain a letter from the Director of the Program confirming the student’s participation in the Internship Program, and encouraging support for the student’s non-remunerated work. Students who already receive student aid may qualify for a Enriched Educational Opportunity bursary. More details on funding, travel logistics and requirements are provided to selected interns in the winter. The Program is supported by the following Faculty funds that serve to cover travel costs and stipends. All selected interns are automatically considered for Faculty funding; there is no need to make a separate application for these. The Program is also supported by the Hans & Tamar Oppenheimer Chair in Public International Law, and the Katharine A. Pearson Chair in Civil Society and Public Policy.